A toxic eggs scandal has 17 countries keeping an eye out for a chemical called fipronil. An investigation by the European Union (EU) has found that the toxic eggs have spread to these different countries after their presence was made know this month. The eggs come from chickens that had their living areas treated with fipronil. Fipronil is a chemical that can cause damage to a person’s liver, thyroid glands and kidneys. The amount on the toxic eggs are minimal and aren’t likely to hurt a person’s health. Fipronil is used to kill fleas, lice and tick in animals, but isn’t allowed on those that are producing foods for human consumption. Looking further into the matter, the EU has discovered that eggs that contain fipronil have been showing up in European countries as far back as April 2017. 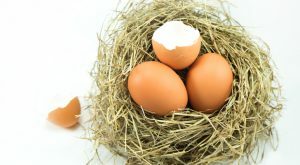 The current scare has many retailers pulling the toxic eggs from shelves, despite them not being a major health threat, reports News.com.au. The search for the source of the toxic eggs has lead the EU to two companies. The first is a Dutch company called ChickFriend and the second is its Belgian supplier Poultry-Vision. This includes arresting two managers at ChickFriend on Thursday. Article printed from InvestorPlace Media, https://investorplace.com/2017/08/toxic-eggs-eu-fipronil/.